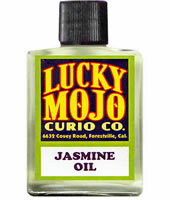 Lucky Mojo Skin Safe Essential Oils! 14-Day Money Drawing Spell with Lodestones and Magnetic Sand here. Hello and welcome to our third Lucky Mojo Newsletter. There has been a lot of great things going on at Lucky Mojo, and we are all busy bees. In this article you'll hear about the great workshops we have scheduled for the May 9th and 10th Party and Workshop, more free spells, an article on how to make your own Hoodoo Oils, and a special interview with the people who make all of our fine products. May 9-10 Party and Workshop Schedule Firming Up. cat yronwode will be teaching two workshops: A Tea Leaf Reading workshop on Saturday will cover the history and techniques of this traditional form of divination; participants will each receive a genuine fortune telling teacup of their own and will practice their skills on one another. A special Jack Balls workshop will be held on Sunday for Hoodoo Rootwork Correspondence Course graduates only. James Dotson will teach on the subject of Perfumes and Incense, their history, how aromatic and energetically active scent formulas are designed, and how they are used in conjure. Students will receive samples of several types of traditional spiritual and magical incenses and will make a simple incense to take home for personal use. Starr Casas will be teaching a workshop on Practical Money Magic Spells, including how to burn candles, use oils, and make mojo hands for prosperity, and attendees will each receive a signed copy of her popular book on money magic to take home. Robin York will conduct one of her famed workshops on Cursing with Doll Babies -- among the most popular and most-requested topics in hoodoo -- and students will prepare a cursing doll and learn how to use it on an enemy. Charles Porterfield will give a workshop on the use of Oil Lamps and other forms of Light in hoodoo, and will guide attendees in the preparation of a miniature functional oil lamp they can take home with them and use. Lara Rivera will conduct a workshop on Bottle Spells and Container Spells, and each attendee will participate in creating a bottle spell to take home and use. 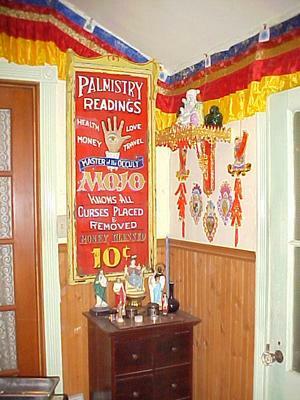 Carin Huber has promised to engage attendees with a crafty, artistic, hands-on presentation called How to Make a Portable Altar; all materials will be supplied, and the results should be spectacular. Party attendance is absolutely FREE, and potluck food and beverages will be provided both days. Cost for the workshops will vary by the cost of ingredients supplied, and will run from $10.00 to $25.00 each. Planning on coming? Drop us a note on the forums and let us know. 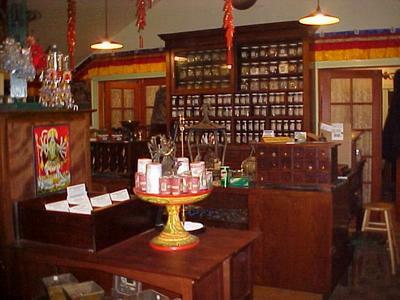 The laboratory at Lucky Mojo is responsible for the production of all of the products made in the store including dressing candles; bagging herbs and minerals; and making up the company's famous conjure oils, sachet powders, bath crystals, and incense powders. All the staff in the lab are qualified spiritual workers themselves and are either graduate-apprentices of cat yronwode's Hoodoo Rootwork Correspondence Course or, if they are new to the shop, they are enrolled in the course and the apprenticeship program. At Lucky Mojo, the work day begins with opening prayers to bless the space and the tasks to be done. Making Lucky Mojo products can take a lot of time and attention to complete. For example, the Cast off Evil Cast off Evil line has 5 different herbs in each of the products. When used in the form of an oil, the herbs, roots, and minerals are left in whole or large-cut form, but for incenses, bath crystals, or sachet powders, the materials must be weighed out, and then ground by hand with a mortar and pestle. After the herbs have been ground and prepared, they are mixed with the base -- and then the essential oils are added. Only cat makes the essential oil blends that are used in the products, so you know that every product you receive has had cat's own special touch in the mix. The essential oils used are all the very best money can buy, costs are never cut in the purchase of the ingredients. Once the products are mixed, they are weighed out again and packaged in the colorful foils you get with your order. The labels are cut and glued on by hand. To maintain a spiritual level of quality and mindfulness during preparation, the foil-packed goods are only made in lots of eight at a time and prayed over before being stocked in the shop. Heidi is the senior spiritual product crafter. Mojo bags are her specialty and she is also the one who makes all the jack balls. Her attention to detail and her beautiful handicraft skills assure you that each product is not only magically powerful but a work of art. Heidi is a graduate of cat's course and apprenticeship program, and she is cross-trained in order entry, database management, packing, and shipping -- which makes her one of the company's most versatile employees. Greg is a graduate of cat's course and apprenticeship program, and is certified in all areas of spiritual goods production, and also heads the book department, which you'll hear more about in the coming weeks. Greg's specialty is hand-crafting oils, including choosing by hand each of the individual herbs that are added to the oil bottles. He carefully selects the whole roots, pieces, and leaves to create the attractive herb display seen in each Lucky Mojo oil. Ian and Oran are new to Lucky Mojo and are currently studying with cat and going through a nine-week week apprentice program to be certified to work in the store. This lengthy process harkens back to apprenticeships in the Middle Ages, as they learn alongside the other trained masters. Ian has a natural spiritual talent that we expect to add great things to Lucky Mojo; Oran is both a root worker and a talented computer person who is cross-training for office and database tasks. 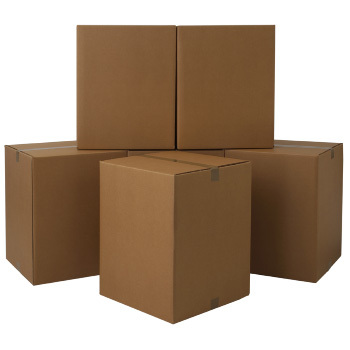 Robin is the shop manager, the mover and shaker who ensures that the orders get out the door. A graduate of cat's course and apprenticeship program, she has the skills and talents to makes every item produced by Lucky Mojo. In addition to her exceptional organizational skills, Robin brings years of personal experience in crafting herbal and oil preparations to the team. Robin sums up the Lucky Mojo philosophy this way: "Like the very best restaurants, where the ingredients are hand selected from local farms and markets and cooked to order, we provide dedicated attention to quality and detail, both in the selection of ingredients and the creation of our spiritual supplies. This isn't Walmart Magic!" We've had great response from the newsletter, and more customers are signing up to receive it everyday! Look for new editions in the coming weeks and months.